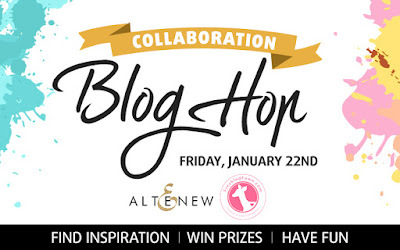 Crafting Confessions: Altenew & Freckled Fawn collaboration blog hop! As I sat down to play with these new pretties along with my stash of wonderful Altenew goodies, I found that the products complemented each other perfectly. I stamped my card front with triangles from the Sohcahtoa stamp set (one of my favourites) and found they co-ordinated so well with the triangles on the washi tape. To try and keep the design balanced, I purposely stamped the triangles on the card base facing upwards as they are on the washi tape. The paperclip at the top helps to guide your eyes to follow the design through the sentiment. The 'you' is a partially stamped sentiment from Label Love and overhangs the focal point slightly to balance with the overhanging paperclip in the opposite corner. Well that's my card (and detailed explanation!) for today's amazing blog hop. Don't forget to comment along with way as there are TWO Freckled Fawn Capture embellishment kits and TWO Atlenew $30 gift certificates up for grabs for randomly selected comments along the hop. Comments must be left by Tuesday 26th January by 11.59am EST. I won't keep you any longer as you're sooooooooo near the end of the blog hop. Next on your hopping adventure is the final stop at the Freckled Fawn blog. Happy hopping and have a fabulous weekend! Great card, wondering if I have any triangles in my stamps. Great card! I love those letters! I always LOVE your cards, this one is so much fun! Love your gorgeous card! That aqua color is awesome and I love all the dimension and pop of color you added! I'm in love with arrows and triangles right now! Just nuts about how you tied in the washi with the background triangles and the addition of the paperclip in the perfect embellie. Oh Love those letters too! Clean and simple isn't easy, but you have created a very special one here. Thanks for the tips! These colors are so fun. I like your tips about keeping the eye focused. I think that's harder then it looks. Thank you for sharing! I love your card! The colors look amazing! Love the combination of colors. It really pops! Perfectly awesome card! All the triangles are fabulous (even the tip of the arrow!) And I love the colors you chose, too! Thanks so much for sharing! I have that same washi tape and didn't know how to use it. Thanks for giving me an idea. Amy, great clean and simple card in beautiful colors. Love those puffy letters. Graphic perfection, and one of my all time fave colour combos too, LOVE! this is so sweet! I love the soft colors. So bright and fun and clean! Really sweet card with wonderful color! Great pairing of two wonderful companies! Cute card. Love the arrow clip. What fun and bright colors! I love it! Nice card. Love your colors. Great clean and simple card. Love the colors. Love the cool graphic design on your card, fabulous!!! Beautiful CAS card, love the color combo and the puffy alphabet stickers! Great colors and nice dimension! 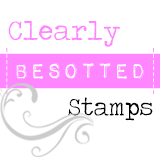 You are right- the stamp and the embellishments just go together so well!! Love the colors on this fun card! You paired the products together so well! Love the color and how it is a clean and simple card! I love the suttle look yet great details of this cards. Sweet! Great card. Love the arrow embellishment and how you have placed it. Nicely done...love the puffy look of the letters!!! Great style! Love your stamped background, your letters and clip. Nice card! Love the colors and the geometric design! Lovely card! Great colour combo! A very good job Amy. I love the colours you used as well! 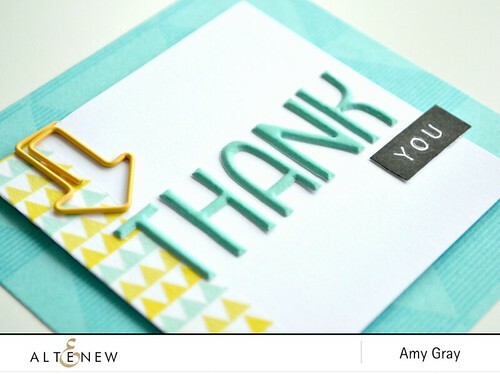 This is a fun and beautiful card, love all the details, specially the dimension you added with the THANK sticker and that pretty arrow, beautiful color combination too. Love the great happy colors you used! And the way you used the different triangles-perfect! Terrific eye flow and I love the background, too! Lovely card and colors on it! 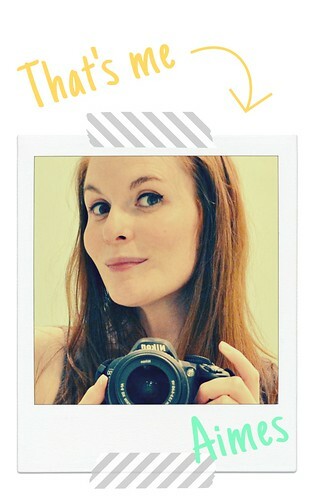 Great graphic thank you card...love those stickers too. I love this card - sort of clean and simple. I am always collecting little clips and then never using them. This is a great way to use them - even a heart shaped one or star would work though I really liked your yellow arrow that matches the paper! Gotta hop along now. I love this card design. The colours and balance etc. Wow! Love those colors together. 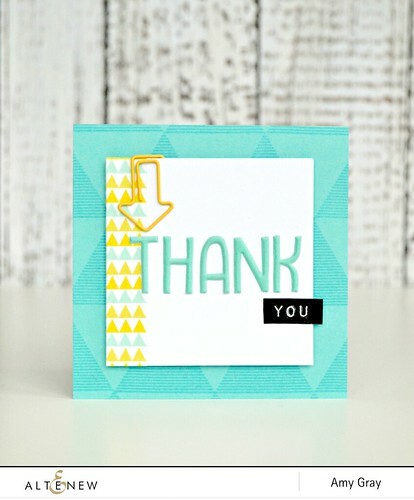 Thanks for sharing this pretty card and your tips. Sweet card!! Love the layout and colors!! Nice card. The alphabet stickers look so bright. I love the dimension they give to the card. i COULD HAVE SWORN YOU STAMPED TRIANGLES WERE WASHI. SO AMAZING! LOVE THE EMBELLISHMENTS. Great design--I like the arrow. Lol you had me at puffy alphabet stickers! Beautiful card, love the colors and arrow!! Thank you for the TIPS! I haven't worked with the washi tape and am new to stamping. I can't wait to and would love to craft with the washi tape :)))) thank you for sharing this sweet inspiration! Love all the triangle elements! Pretty card! I love the fun, bright colors and the geometric washi tape. Thanks for sharing. Great colors, I love those alphabet stickers too! So CAS, I love this! Those alphas and the arrow are just perfect! Thank you for your beautiful card. nice colour! i love it!!! Such a fab and clean design. Love it! The colors, the puffy letters and the triangles stamps. everything is just perfect. Thanks for the beautiful inspiration you just give to us. Love all these creativity from all you guys on this blog hops! !